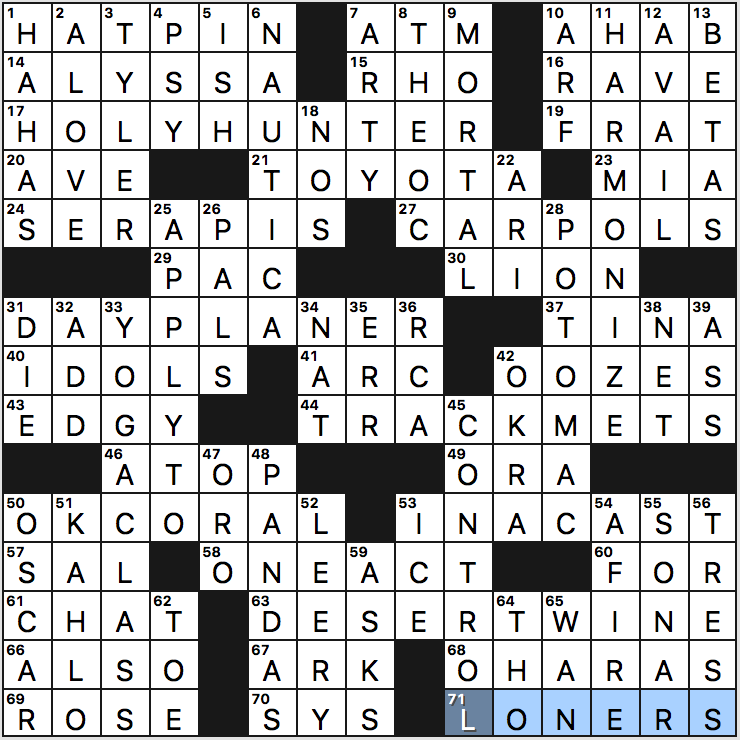 The revealer at 71a is LONERS with the clue [Single sorts, and the letters dropped from pairs in the theme answers]. Each theme answer has had a double letter reduced to a single letter, thereby changing the meaning of the name/phrase. 17a [Knight on a quest for the Grail, say?] HOLY HUNTER. Actress Holly Hunter. 27a [Candidates campaigning on the road?] CAR POLS. Carpools. 31a [Carpenter who only smooths wood when the sun shines?] DAY PLANER. Day planner. 44a [Follow the progress of an NL East team?] TRACK METS. Track meets. 50a [Makeup of a satisfactory reef?] OK CORAL. OK Corral. 63a [Syrah served in the Sahara?] DESERT WINE. Dessert wine. My first instinct was to read the revealer as “lone Rs,” i.e. double-Rs reduced to single Rs. Even though I had already found HOLY HUNTER, I wanted this to be the case. But I quickly dismissed it and decided that the double letters in question were randomly chosen. As such, I was prepared to write a rather tepid review, but then I read the revealer more closely. That’s when I realized that the dropped letters actually spell out the word LONERS. Aha! That’s a very nice touch that constrains the theme significantly, making the result more impressive. As for the fill, I’m not a fan of APPLY TO, but the rest is solid to good, especially YOGA CLASS, HARMONIZE, POTOMAC, and brand names TOYOTA and NAUTICA. I didn’t know SERAPIS [British frigate captured by John Paul Jones] and wondered why it wasn’t clued with respect to the garments. Only later did I realize I was thinking of serapes with an E.
Cluing seemed fairly straightforward — nothing to write home about, but nothing too off-the-wall. The coral entry reminded me of a video I saw the other day about scientists growing coral at a much faster rate than previously in an attempt to save the world’s reefs. Have a look. I was so close to solving this puzzle in 2 minutes and 12 seconds! Alas. 18a, NEW YORK’S AREA CODE [68-Down]. 42a, LINCOLN’S BIRTHDAY [68-Down with a “/” inside it]. Abraham Lincoln was born on February 12th, 1809 (2/12). 67a, H2O’S BOILING POINT [68-Down with a “°” after it]. Specifically, with a “°F” after it, since 212° any temperature scale besides Fahrenheit isn’t the boiling point of water. I really like that this entry incorporates one of the digits in the revealer. It’s worth noting that the word “palindromic” was probably included in the revealer entry because one of the editors felt that the “2” in 72a, W2S [Some I.R.S. forms] wasn’t a fair crossing for the final “2” in 212, and so it needed an extra hint. I’m shocked Will & co. didn’t save this for February 12th — this feels like a very on-the-nose date-tribute puzzle, especially with the central entry being LINCOLN’S BIRTHDAY. I guess they couldn’t bring themselves to run this challenging of a gimmick on a Tuesday (which is when 2/12/2019 falls) or a Wednesday (2/12/2020), and they didn’t want to wait until the next 2/12 Thursday (2/12/2026). That said, overall this was not a challenging puzzle. The presence of numbers in the grid is Thursday-ish to be sure, but those are localized to a single corner of the grid, and the rest of the theme is straightforward. 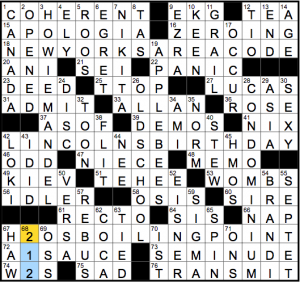 I thought the clues were ratcheted up a notch in difficulty to compensate: many clues were challenging through vagueness, like [Exploit] for DEED, [Commercial lead-in to film] for LUCAS, [Expire] for END (could have been DIE), [Development sites] for WOMBS (which in crossword-land is often UTERI), and so on. [Leaves after dinner?] was a fun clue for TEA. 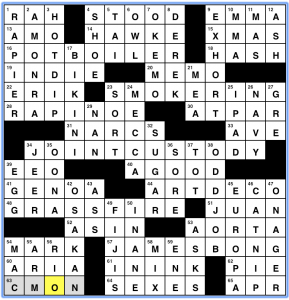 As for the fill, I liked seeing HOWIE MANDEL, CONDOMINIUM, APPLEBEE’S, OLD SCHOOL, and APOLOGIA, and I find the word SEMINUDE delightfully silly. If I never saw ANI clued as a [Tropical black bird] again, it would be too soon, and I never love seeing -OSIS in a grid, but otherwise, I thought the fill was pretty solid, which is to be expected from an 81-word 16×15 grid with few restrictions. Overall, I’m fairly whelmed. These sure are three things that are represented by the number “212.” The recurrence of the number 212 across multiple disciplines is mildly interesting, though I’d argue 2/12 is materially different from 212. The execution was solid, and I’d argue that an easy Thursday puzzle on occasion is a good thing. By the by, AZEALIA BANKS SONG is also 16 letters, though “212” it gets its title from the New York area code. By the by, if you want to listen to the song, let me offer a hearty content/language warning. 23:10. Jenni’s on the road, so I’ve stepped in to spell her. I’m seeing Paul Coulter everywhere these days, it seems. He had a nice Sunday NYT last month early, an LAT last week, and a Universal earlier this week. I was not disappointed with a time of under half an hour. A speed solver I am not. And I was happy with how this one unfolded for me. 17a [After 13-Down, did something quickly after not having done it quickly enough] FOR LOST TIME–So, not exactly 13-Down, you might say, but 13-Up. MADE UP FOR LOST TIME. 27a [After 11-Down, try not to be outdone by your neighbors] WITH THE JONESES–KEEP UP WITH THE JONESES. Interestingly, I’ve seen JONESES in another puzzle within the last week. I’m fairly sure it was not one of Paul’s, though. If there is a meta in here beyond this clever theme, I am not seeing it. You will have to tell me about it in the comments section. 22a [Duke of video games] NUKEM–I did not know Duke Nukem. I do now. But for the practice–in reviews and such–of listing clues and answers together, I don’t think I’d even have noticed this. Again, it’s simply a non-issue. Good job, Paul and Peter! 4.25 stars! It’s a series of marijuana-related puns about detectives! In a salute to this puzzle’s theme, please enjoy Tommy Chong (of “Up in Smoke” fame) dressed as a pineapple with abs, singing Cake’s version of “I Will Survive” on The Masked Singer, a program that is the sort of thing that would be a cutaway gag on 30 Rock but is also an absolute delight. [… in the Potterverse], DARKARTS. Don’t understand the purpose of that prepositional phrase at all. [Symbolized], TOKENED. Ok, who is going around using this as a verb? [WWI battle river], YSER. Clues for this should always acknowledge that, apart from the huge battles, it’s a pretty irrelevant river. [1964 Anthony Quinn role], ALEXISZORBA. Is he known by that or just ZORBATHEGREEK? This entry was posted in Daily Puzzles and tagged Brendan Emmett Quigley, Ed Sessa, Mike Shenk, Paul Coulter, Peter A. Collins, Peter Collins. Bookmark the permalink. Did anyone else throw Steve Harvey in at 3D? Oh man, this is a really clever misdirecting clue! i didn’t think i knew any other game show hosts names besides steve harvey! clever misdirect. Parts of the revealer occur literally dozens of times in the clues! What an outrageous dupe! Did any other Across Lite users get flagged for the correct digit characters? I didn’t get Mr Happy Pencil, couldn’t see any errors, so clicked on ‘reveal’ — and it changed ‘2’ to ‘2’ in those two squares! That was a blast of a Thursday. 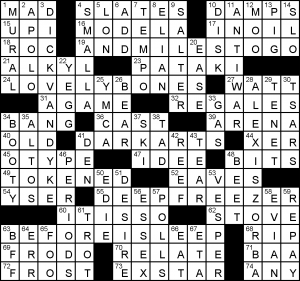 Kudos to Peter A. Collins for a terrific puzzle. I’d like to agree with Ethan here. This is one Thursday I enjoyed enormously. One slight nit of mine would address NEWYORKSAREACODE. If it hadn’t needed the genitive S in the middle because it had to be 16 letters long, it would have actually been correct, but with the S it arrogated to itself too much. I still loved the puzzle, though. I really enjoyed the NYT. I’ve actually thought to myself at times that constructors rarely use non-letter characters in puzzles. Wouldn’t want to see it all the time, but it’s a nice change of pace, and the number-including clues were fun. Definitely agree that this should have been published on February 12. With some slight adjustments it would have fit fine on a Tuesday IMO. 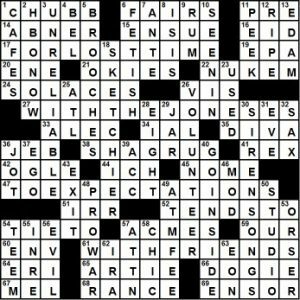 Has anyone noticed any difference in the difficulty of the Fireball Crosswords lately?